those who attend. USA sailor participation is limited to those who are "Team Trials Qualified." 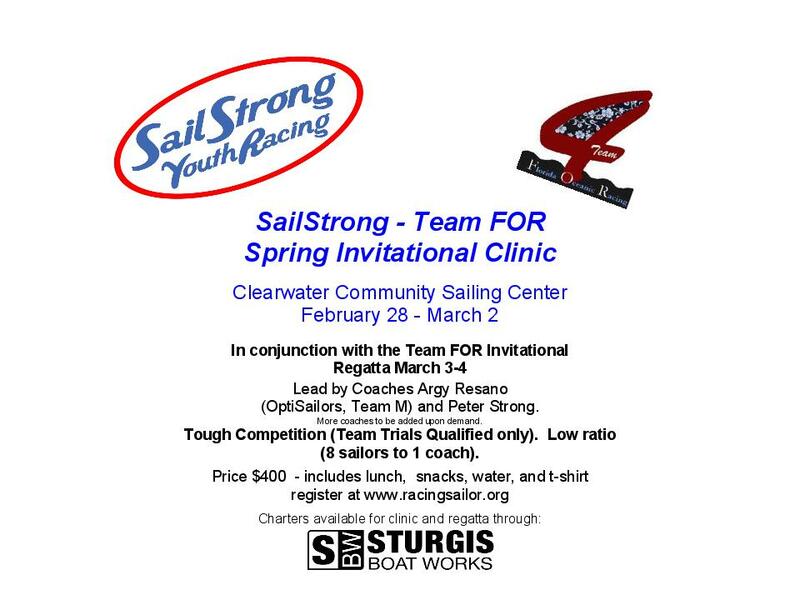 International Opti sailors are welcome to request an invitation by emailing info@teamfor.com. during the week leading up to our regatta, making the trip even more worthwhile: http://sailstrong.files.wordpress.com/2011/09/springclinicflier.jpg. of several other facilities, including Tampa International (TPA), www.tampaairport.com, Sarasota-Bradenton (SRQ), www.srq-airport.com, and Orlando International (MCO), www.orlandoairports.net. Nationals, Asians, Europeans, and Worlds. coordinate coach boat coverage for sailors unable to attend with their coaches. * Please email* *so possible arrangements can be made or suggested.